IN the last chapter the agricultural research of today was severely criticized; its many shortcomings were frankly set out; suggestions were made for its gradual amendment. That these strictures are justified will be evident if we examine in detail a piece of successful research carried out on the sugar-cane crop in India during a period of nearly twenty-seven years: 1908-35. In 1910 the investigations on sugar-cane in Northern India were mainly concentrated in the United Provinces, where a considerable local industry was already in existence. Narrow-leaved, thin canes were planted under irrigation at the beginning of the hot season in March; the crop was crushed by bullock power during the cold weather (January to March); the juice was converted into crude sugar in open pans. The yield was low, a little over one ton to the acre on the average. It was decided to develop this primitive industry and the work, at first purely chemical, was placed in the hands of Mr. George Clarke, the Agricultural Chemist. The choice proved to be a happy one. Clarke combined a first-class knowledge of chemistry and general science with considerable experience of research methods, obtained under Professors Kipping and Pope at Nottingham University College and the School of Technology, Manchester. The son of a south Lincolnshire farmer, he had all his life been familiar with good agricultural practice and had inherited a marked aptitude for farming from a long line of yeomen ancestors. He had therefore acquired the three preliminary qualifications essential for an investigator in agriculture, namely, the makings of a good farmer, a sound training in science, and a first-hand acquaintance with methods of research. It will be seen from what follows that he also possessed the gift of correct diagnosis, the capacity to pose to himself the problems to be investigated, the persistence to solve them, and the drive needed to get the results taken up by the people and firmly welded into the practice of the country-side. Clarke was most fortunate in the choice of his staff. He had associated with him throughout two Indian officers -- S. C. Banerji (afterwards Rai Bahadur) and Sheikh Mahomed Naib Husain (afterwards Khan Bahadur). Banerji, who possessed the dignity and repose of his race, was in charge of the laboratories -- always a model of order and efficiency -- and was accurate and painstaking almost beyond belief. Naib Husain was of a very different temperament -- hot-tempered and full of the energy and drive needed to break new ground in crop production. His absorbing interest in life was the Shahjahanpur farm and the condition of his crops and he never spared himself to make all he undertook a success. Both these men gave their lives to their work and both lived to see their efforts crowned with success, and the Shahjahanpur farm the centre of perhaps the most remarkable example of rural development so far achieved. No European officer in India has ever had more loyal assistants; Indian agriculture has never been served with more devotion. I saw much of their work and watched the growth of the modest but efficient organization they helped to build. It is a great regret to me that they are not here to read this genuine tribute of admiration and respect from a fellow worker of another race. It had been the custom till 1912 in the United Provinces to keep their scientific officers isolated from the practical side of agricultural improvement, and there were no clear ideas how the combined scientific and practical problems connected with cane cultivation should be tackled. It did not strike any one that it would be necessary for the scientific investigator to grow the crop and master the local agriculture before any improvement could be devised and tried. When therefore in 1911 Clarke asked to be provided with a farm, there was a good deal of discussion and some amazement. The matter was referred to the All-India Board of Agriculture in 1911, where the proposal was severely criticized. The agricultural members did not like the idea of scientific men having land of their own; the representatives of science considered they would lose caste if another of their number took up farming. In 1912 I happened to be on tour in the United Provinces when the matter came up for final decision. The Director of Agriculture asked my advice. I strongly supported Clarke's proposal and assured the authorities that great things would result if they gave their agricultural chemist the best farm they could, and then left him alone to work out his own salvation. This carried the day; a special sugar-cane farm was established in 1912 near Shahjahanpur on the bank of the Kanout river and on one of the main roads leading into the town. From 1912 to 1931, an unbroken period of nineteen years, Clarke remained in charge of Shahjahanpur in addition to the three posts he held: Agricultural Chemist (1907-21), Principal of the Agricultural College (1919-21), and Director of Agriculture (1921-31). From 1912 to 1921 he was there nearly every week-end. Until he became Director of Agriculture in 1921, he was at Shahjahanpur every year from Christmas until March for the sugar-cane harvest and the planting of the next year's crop. It was during these periods that he gained a first-hand knowledge of the Indian village, its people, its fields, and its agricultural problems, which was to stand him in such good stead when he was called upon to direct the agricultural development of the Provinces in the early years of the Montagu-Chelmsford Reforms. The sugar-growing tract of northern India, the most important in the country, is a broad strip of deep alluvial land about 500 miles in length skirting the Himalayas. It begins in Bihar; it ends in the Punjab, and reaches its greatest development in the Revenue Divisions of Gorakhpur, Meerut, and Rohilkhand of the United Provinces. The soil is easily cultivated and is particularly suitable for the root development of the sugar-cane. The climate, however, is not particularly favourable as the growing period is so short and confined to the rainy season -- the last half of June, July, August, and September -- when the moist tropical conditions created by the south-west monsoon are established. The rains are followed by the cold season (October I5th to March 15th) during which very little rain is received. After the middle of March the weather again changes, becoming very hot and dry till the break of the rains in June. During the hot weather the cane, which is usually planted towards the end of February, has to be irrigated. When work was started in 1912, the yield of stripped cane on 95 per cent. of the sugar-cane area of the United Provinces was only 13 tons to the acre, producing just over 1 ton of crude sugar (gur). The land was fallowed during the previous rains and was well prepared for the crop by 15 to 20 shallow ploughings with the native plough. As in many other Indian crops a good balance has been established, as a result of age-long experience, between the methods of cultivation and the economic capacity of the indigenous varieties. The methods of cultivation, the nitrogen supply, and the kinds grown were all in correct relation the one to the other. These varieties had been cultivated for at least twenty centuries and were thin, short, and very fibrous with juice rich in sugar in good seasons. They remind one more of the wild species of the genus Saccharum than of the thick sugar-canes found in tropical countries. Five or six varieties are grown together, each with a name, usually of Sanskrit origin, denoting their qualities, and each is readily recognized by the people. The types of cane grown by the cultivators in the Rohilkhand Division were first separated and an attempt was made to intensify the cultivation of the best. The yield of cane was raised from 13 to 16 tons per acre without deterioration in the quality of the juice, but further intensification did not succeed. As much as 27 tons to the acre was obtained, but the thin, watery juice contained so little sugar that it was not worth extracting. The variety and the improved soil conditions were not in correct relation. The leaf area developed by the indigenous varieties was insufficient, in the short growing period of North India, to manufacture the cellulose required for the fibre and other tissue of so large a crop, and enough sugar to make the juice of economic value. This was a most important experiment as it defined the general problem and showed definitely what had to be done. To raise the out-turn of sugar in the United Provinces, a combination of intensive methods of cultivation with more efficient varieties, adapted to the very special climatic conditions, would be necessary. These two problems were taken up simultaneously: in all the subsequent work the greatest care was taken to avoid the fragmentation of the factors, a rock on which so much of the agricultural research of the present day founders. Attention was then paid to the two chief factors underlying the problem: (1) the discovery of a suitable cane, and (2) the study of intensive cane growing with the object of finding out the maximum yield that could be obtained. The collection of cane varieties at Shahjahanpur included a Java seedling -- POJ 213 which was exactly suited to the local soil and climate and which responded to intensive cultivation. This Java cane was a hybrid. Its pollen parent was the Rohilkhand variety Chunni, which had been given to the Dutch experts, who visited India twenty years earlier, by the Rosa Sugar Factory. Chunni was immune to sereh -- a serious disease then threatening the sugar industry in Java -- and, when crossed with rich tropical canes, produced immune or very resistant seedlings of good quality, widely known throughout the world as POJ (Passoerean Ost-Java) seedlings. POJ 213 proved invaluable during the early stages of the Shahjahanpur work. It was readily accepted by the cultivators among whom it was known as 'Java'. A large area was soon grown in Rohilkhand and it saved the local sugar industry then on the verge of extinction. Most important of all it created an interest in new kinds of sugar-cane and prepared the ground for the great advance, which came a few years later when a Coimbatore seedling -- Co 213 -- raised by the late Dr. Barber, C.I.E. -- replaced it. Clarke had not been long in the United Provinces before he noticed that the soil of the Gangetic plain could be handled in much the same way as that of the Holland Division of Lincolnshire, where the intensive cultivation of potatoes had been introduced sixty or seventy years before and brought to a high state of perfection. Both soils are alluvial though of widely different date. The problems connected with the intensive cultivation of potatoes in Lincolnshire and sugar-cane in the United Provinces have a great deal in common. Both crops are propagated vegetatively, and in both it is a most important point to produce the soil conditions necessary to develop the young plant quickly, so that it is ready to manufacture and store a large quantity of carbohydrate in a short period of favourable climatic conditions. When the intensification of sugar-cane cultivation was begun at Shahjahanpur, the lessons learnt in the potato fields of Lincolnshire were at once applied. During the fallow which preceded the crop the land was cultivated and, as soon as possible after the retreat of the monsoon, the farm-yard manure was put on and ploughed in. This gave the time necessary for a valuable supply of humus to be formed in the top layer of the soil. The sugar-cane was planted in shallow trenches 2 feet wide, 4 feet from centre to centre. 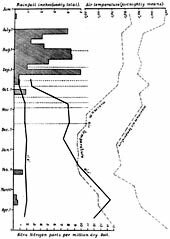 The soil from each trench was removed to a depth of 6 inches and piled on the 2 feet space left between each two trenches, the whole making a series of ridges as illustrated in Fig. 6. As soon as the trenches are made in November, they are dug with a local tool (kasi) to a further depth of 9 inches, and the oilcake, or whatever concentrated organic manure is available, is thoroughly mixed with the soil of the floor of the trenches and allowed to remain, with occasional digging, till planting time in February. The thorough cultivation and manuring of the trenches at least two months, and preferably three, before the canes are planted, proved to be essential if the best results were to be obtained. Readers familiar with the methods of sugar-cane cultivation in Java will at once realize that this Shahjahanpur method is a definite advance on that in use in Java, in that the use of artificials is entirely unnecessary. Hand-made trenches always give better yields than those made by mechanical means -- an interesting result, which has often been obtained elsewhere, but which has never been adequately explained. It may be that speed in cultivation is an adverse factor in the production of tilth. At first heavy dressings of organic manures like castor cake meal at the rate of about 2,870 lb. to the acre were used in the trenches. This contains about 4.5 per cent. of nitrogen, so that 2,870 lb. is equivalent to 130 lb. of nitrogen to the acre. This heavy manuring, however, was soon reduced after the introduction of the method of green-manuring described below. When green-manuring was properly carried out, the dung applied before making the trenches could be reduced to half or even less. At first the trenches were irrigated about a month before planting and lightly cultivated when dry enough. These operations promoted the decay of the manure, and allowed for abundant soil aeration. The canes were planted in the freshly dug moist rich earth towards the end of February. Later this preliminary watering was dispensed with. The cuttings were planted in the dry earth, and lightly watered the next day. This saved one irrigation and proved to be an effective protection from white ants (Termites), which often attacked the cane cuttings unless these started growth at once and the young plants quickly established themselves. Four light waterings, followed in every case by surface cultivation, were necessary before the break of the monsoon in June. As soon as the young canes were about 2 feet high, and were filtering vigorously, the trenches were gradually filled in, beginning about the middle of May and completing the operation by the end of the month. Before the rains began, the earthing up of the canes commenced. It was completed by about the middle of July (Fig. 7). One of the consequences of earthing up canes, grown in fertile soil, observed by Clarke was the copious development of fungi which were plainly visible as threads of white mycelium all through the soil of the ridges, and particularly round the active roots. As the sugar-cane is a mycorrhiza-former there is little doubt that the mycelium, observed in such quantities, was connected with the mycorrhizal association. The provision of all the factors needed for this association -- humus, aeration, moisture, and a constant supply of active roots -- probably explains why such good results have always followed this method of growing the cane and why the crops are so healthy. When grown on the flat, want of soil aeration would always be a limiting factor in the full establishment of the mycorrhiza. The operation of earthing up serves four purposes: (1) the succession of new roots, arising from the lower nodes, thoroughly combs the highly aerated and fertile soil of the ridges; (2) the conditions suitable for the development of the mycorrhizal association are provided; (3) the standing power of the canes during the rains is vastly improved; and (4) the excessive development of colloids in the surface soil is prevented. If this earthing up is omitted, a heavy crop of cane is almost always levelled by the monsoon gales; crops which fall down during the rains never give the much-prized light coloured crude sugar. The production of colloids in the surface soil, when the canes are grown on the flat, always interferes with soil aeration during the period when sugar is being formed; crops which ripen under conditions of poor soil aeration never give the maximum yield. An essential factor in obtaining the highest efficiency in this ridging system is good surface drainage. This was achieved by lowering the earth roads and paths which, when grassed over, acted as very efficient drains for carrying off the excess rainfall during the monsoon. The surface water collected in the trenches which were suitably connected with the system of lowered paths and roads. By this means the drainage crept away, in thin sheets of clear water, to the river without any loss of organic matter or of fine soil particles. The grass carpet acted as a most efficient filter and was at the same time manured. The roads yielded good crops of grass for the work cattle. This simple device should be utilized wherever possible to prevent both water-logging and soil erosion. The results of this intensive method of cane cultivation -- based on the growth of efficient varieties, proper soil aeration, good surface drainage, carefully controlled irrigation, and an adequate supply of organic matter -- were astounding. In place of 13 tons of cane and just over a ton of sugar per acre, a yield of just over or just under 36 tons of cane and 3-1/2 tons of sugar per acre was obtained for a period of twenty years -- year in and year out. These are the figures for the farm as a whole. The yield of sugar had been trebled. Such a result has rarely been obtained for any crop in so short a time and by such simple means. In a few cases yields as high as 44 tons of cane and 4-1/2 tons of sugar were obtained, figures which probably represent the highest possible production in the climate of the United Provinces. In working out this method of cane growing in northern India, two critical periods in sugar production were observed: (1) May and early June when the tillers and root system are developing, and (2) August and September when the main storage of sugar takes place. A check received at either of these periods permanently reduces the yield. The acre yield of sugar is positively and closely correlated with the amount of nitrate nitrogen in the soil during the first period and with soil moisture, soil aeration, and atmospheric humidity in the second period. Any improvement in cane growing must therefore take into account these two principles. A new method of intensive cane cultivation had been devised and put into successful practice on a field scale at a State Experiment Station; the first step in improving sugar production had been taken. It was now necessary to fit this advance into a system of agriculture made up of a multitude of small holdings, varying from an average of 4 acres in the eastern districts to 8 acres in the western half of the province. Each holding is not only minute but it is divided into tiny fields, scattered over the village area, which is by no means uniform in fertility. Moreover, the farmers of these small holdings possess practically no capital for investment in intensive agriculture. How could the average cultivator obtain the necessary manure ? The solution of this problem entailed a detailed study of the nitrogen cycle on the Gangetic alluvium, the relation between climate, methods of cultivation, and the accumulation of soil nitrate as well as the discovery of what amounts to a new method of green-manuring for sugar-cane. These investigations were set in motion the moment the possibilities of intensive cane growing became apparent. The study of the nitrogen cycle, in any locality, naturally includes an intimate acquaintance with the local agriculture. The outstanding feature of the agricultural year in the United Provinces is the rapidity with which the seasons change, and the wide variation in their character. The most important of these abrupt transitions are: (1) change from the excessive dryness and high temperatures of April, May, and early June to the moist tropical conditions which set in when the summer crops are sown at the end of June, immediately after the break of the southwest monsoon, and (2) the sudden transition from high humidity, high temperature, and a saturated condition of the soil, at the end of the monsoon in September, to the dry temperate conditions which obtain when the autumn sowings of food crops take place in October. These sudden seasonal changes impose definite limits on what can be done to increase production. There is very little time for the preparation of the land, or for the manufacture of plant food by biological agencies; the period of active growth of the crop is severely limited. The former influences the methods of cultivation and manuring; the latter the selection of varieties. The wide difference between the two agricultural seasons in the United Provinces is best realized in the autumn (November and December), when crops of ripening cane and growing wheat are to be seen side by side in adjacent fields. How do the summer and autumn crops, often raised in this area under extensive methods, manage to obtain a supply of nitrate without any added manure, and how is it that the soil fertility of the Gangetic alluvium remains so constant? To begin to answer these questions, soil borings from a typical unmanured area -- fallowed after the wheat crop which was removed in April -- were systematically examined and the nitric nitrogen estimated directly by Schloesing's method. The results, as well as the details of temperature and rainfall, are given in Plate VII. 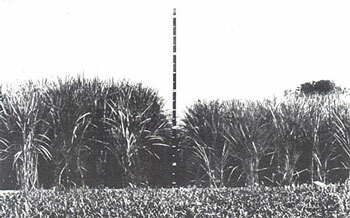 The curve brings out clearly: (1) the large and rapid formation of nitrate as the temperature rises in February and March, just at the time when the young sugar-cane plant takes in its supply of nitrogen, (2) the almost complete disappearance of nitrates from the soil after the first falls of heavy rain -- these are partly washed out and partly immobilized by fungous growth, provided the humus content of the soil has been maintained, (3) the absence of nitrification in the saturated soil during the monsoon, (4) another accumulation of nitrate (less rapid and less in quantity than in the spring) which occurs in the autumn, following the drying of the soil at the end of the rains, combined with improved aeration, the result of frequent surface cultivation. Five ploughings to a depth of 3 inches, followed by the levelling beam, were given between September 25th and November 30th. These accumulations, obviously the result of biological processes, fit in with the quantitative requirements of the summer and autumn crops, which need immediate supplies of nitrogen as soon as the seed germinates. When we compare these results on nitrate accumulation with what the Indian cultivator is doing, we are lost in admiration of the way he sets about his task. With no help from science, and by observation alone, he has in the course of ages adjusted his methods of agriculture to the conservation of soil fertility in a most remarkable manner. He is by no means the ignorant and backward villager he is sometimes represented to be, but among the most economical farmers in the world as far as the management of the potent element of fertility -- combined nitrogen -- goes, and tropical agriculture all over the world has much to learn from him. The sugar grower of the great plains of India cannot take a heavy overdraft of nitrogen from his soil. He has only a limited store -- the small current account provided by non-symbiotic nitrogen fixation and the capital stock of humus needed to maintain the crumb structure and the general life of the soil. He must make the most of his current account; he dare not utilize any of his capital. He has in the course of ages instinctively devised methods of management which fulfil these conditions. He does not over-cultivate or cultivate at the wrong time. Nothing is done to over-oxidize his precious floating nitrogen or to destroy his capital of humus. He probably does more with a little nitrogen than any farmer in the world outside China. For countless ages he has been able to maintain the present standard of fertility. If the production of sugar was to be raised, obviously the first step was to provide more nitrate for the critical growth period of May and June, when the tillers and root system are developing. The conventional method would be to stimulate the crop by the addition of factory-made and imported fertilizers such as sulphate of ammonia. There are weighty objections to such a course. The cultivator could not afford them; the supply might be cut off in time of war; the effect of adding these substances to the soil would be to upset the balance of soil fertility -- the foundation of the Indian Empire -- by setting in motion oxidation processes which would eat into India's capital, and burn up the vital store of soil humus. Increased crops would indeed be obtained for a few years, but at what a cost -- lowered soil fertility, lowered production, inferior quality, diseases of crops, of animals, and of the population, and finally diseases of the soil itself, such as soil erosion and a desert of alkali land! To place in the hands of the cultivator such a means of temporarily increasing his crops would be more than a mere error of judgement: it would be a crime. The use of artificials being ruled out altogether, some alternative source of nitrogen had to be found. Any intensive method of sugar growing in the United Provinces must accomplish two things: (1) the normal accumulations of nitrates in the soil at the beginning of the rains must be fully utilized, and (2) the content of soil organic matter must be raised and the biological processes speeded up so that these natural accumulations can be increased. The problem of making use of the nitrate naturally formed in order to raise the content of organic matter was solved in a very neat fashion -- by a new method of green-manuring. The fallow, which ordinarily precedes cane, was used to grow a crop of san hemp with the help of about 4 tons of farm-yard manure to the acre. This small dressing of cattle manure had a remarkable effect on the speed of growth and also on the way the green crop decayed when it was ploughed in. Yields of 8 tons of green-manure were produced in about 60 days which added nearly 2 tons of organic matter, or 75 lb. of nitrogen, to each acre. In this way the nitrates accumulated at the break of the rains were absorbed and immobilized; a large mass of crude organic material was provided by the green manure itself and by the small dressing of farm-yard manure applied before sowing. Sheet composting took place in the surface soil. The early stages of decomposition need ample moisture. The rainfall after the green crop was ploughed in was carefully watched. If it was less than 5 inches in the first fortnight in September, the fields were irrigated. In this way an abundant fungous growth was secured on the green-manure as the land slowly dried. The conversion of the whole of the green crop into humus was not complete until the end of November. Nitrification then began, slowly, owing to the low temperatures of the cold weather in North India and at a season when there is little risk of loss. It was not until the newly planted canes were watered at the end of February and the temperature rose at the beginning of the hot weather that all the available nitrogen in the freshly prepared humus was rapidly nitrified to meet the growing needs of the developing root system of the cane. This means simply that a definite time is required for the formation of humus, whether it takes place in the soil by sheet composting or in the compost heap, a longer period being required in the soil than in the heap. The gradual filling of the trenches and the watering of the canes during the hot weather continued the nitrification process, which was carried a stage farther by the earthing up of the canes. The provision of drainage trenches between the rows reduced to a minimum any losses of nitrogen due to poor soil aeration following the formation of soil colloids. The canes were thus provided with ample nitrate throughout the growth period. The conditions necessary for the mycorrhizal association were also established. The effects of green-manuring on the nitrate supply is shown in Plate VIII. 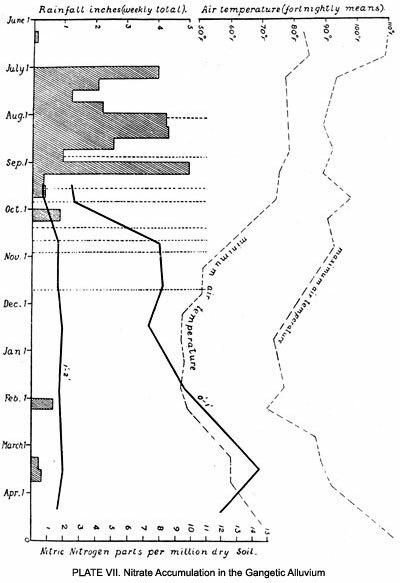 It will be seen that the enrichment of the soil with humus has markedly increased the amount of nitrate formed during the crucial period (March to June) when the rapidly growing cane absorbs most of its supplies. These control plots are representative of the fertile plots of the Shahjahanpur Experiment Station, not of the fields of the cultivators. The crop in the field is shown in Plate IX. The practical result of this simple method of intensive cane growing worked out at a profit of £6 an acre. These satisfactory results were reflected in the annual statement of income and expenditure of the Shahjahanpur Experiment Station. For many years income exceeded expenditure by about 50 per cent. The question therefore of the practical value of the work done at this Station needed no argument. It was obvious. By the help of green-manure alone, supplemented by a small dressing of cattle dung, the yield of cane was raised from 13 to over 30 tons to the acre; the yield of sugar from 1 ton to over 3 tons. The effect of the intensive cultivation of sugar-cane is not confined to that crop. The residual fertility and the deep cultivation of the trenches enabled bumper crops of Pusa wheat and gram -- the two rotation crops grown with cane at Shahjahanpur -- to be obtained. These were more than three times the average yields obtained by the cultivators. In one case in a field of 31 acres, Pusa 12 wheat gave 35 maunds to the acre with one irrigation of 4 inches in November. The preceding cane crop was Ashy Mauritius, which yielded 34.7 tons to the acre. In the early days of the Shahjahanpur farm the effect of the cane trenches on the following wheat crop was very pronounced. The surface of the wheat fields resembled a sheet of corrugated iron, the ridges corresponding to the trenches. After a few sugar crops this condition passed off, and the wheat appeared uniform; all the land had been raised to the new level of fertility. The unimproved crop in an average year yielded 350 maunds per acre (1 maund = 82-1/7 lb. ; 27.2 maunds = 1 ton). The best indigenous varieties, grown at their maximum capacity with slightly deeper ploughing than the cultivator gives and a small quantity of manure, gave 450 maunds per acre. The introduction of new varieties like POJ 213 and Co 213, grown on the flat with the same cultivation as (2) above, gave 600 maunds per acre. The increment due to variety was therefore 150 mounds per acre (600 -- 450). The use of new varieties plus green-manure on the flat without trenches yielded 800 maunds per acre. The increment due to green-manure was therefore 200 maunds per acre (800 - 600). Intensive cultivation in trenches, with green-manure plus the manuring of the trenches with castor cake meal at the rate of 1,640 lb. per acre, yielded 1,000 maunds per acre. The increment due to improved soil aeration and an adequate supply of humus in the trenches was therefore 200 maunds per acre (1,000 -- 800). The very highest yield ever obtained at Shahjahanpur by the use of (5) above was 1,200 maunds per acre. The additional increment, when all the factors were functioning at or near their optima was 200 maunds per acre (1,200 -- 1,000). It will be seen that a combination of variety, green manuring, and correct soil management, including the manuring of the trenches, added 650 maunds per acre (1,000-350) and that increases of 850 maunds per acre are possible (1,200-350). In the intensive trench method the plant attains an exceptionally high efficiency in the synthesis of carbohydrates. In an out- turn test at Shahjahanpur 1,200 maunds of stripped cane per acre contained 17 per cent. of fibre (mostly pure cellulose), 12 per cent. of sucrose, and 1 per cent. of invert sugar. The total quantity of carbohydrate synthesized per acre in about four months of active growth was 204 maunds of cellulose, 144 maunds of sucrose, and 12 maunds of invert sugar; in all 360 maunds (13.2 tons) per acre of carbohydrates. This means 3.3 tons per acre during the period of active growth when every assistance as regards choice of variety, soil fertility, and soil management had been provided. We have in these Shahjahanpur results a perfect example of the manufacture of humus by means of a green-manure crop and its utilization afterwards. Success depends on two things: (1) a knowledge of the nitrogen cycle and of the conditions under which humus is manufactured and utilized, and (2) an effective agricultural technique based on these biological principles. 1. Should an attempt be made to introduce the full Shahjahanpur methods -- improved green-manuring, manured trenches, and new varieties -- or should a beginning be made with green-manuring plus new varieties with or without trenches according to circumstances? It was finally decided to introduce the new variety along with the new method of green- manuring and to omit the trenches. This decision was made because of the scarcity of manure for the full Shahjahanpur method. This difficulty, however, was removed in 1931, the year Clarke left India, with the introduction of the Indore Process, which could have provided every village with an adequate supply of manure for intensive methods. 2. Should a large organization be created for bringing the results to the notice of the villagers? At this point the Agricultural Department was transferred to the control of an Indian Minister, and Clarke became Director of Agriculture in the United Provinces and a member of the Legislative Council, offices which he held with short temporary breaks for ten years. He was thus provided with administrative powers for developing to the full the results of his work as a scientific investigator. The first two Ministers under whom he served, Mr. C. Y. Chintamani (now Sir Chirravoori) and the Nawab of Chhatari, though of widely different political views, were in complete agreement regarding the necessity of agricultural development and both gave their unqualified support to the proposals which were placed before them, while in the Council itself members of every shade of opinion, from the extreme Left to the extreme Right, demanded a large extension of agricultural work. The annual debate on the agricultural budget was one of the events of the year. From 1921 to 1931 the financial proposals of Government for agricultural improvement were passed without an adverse vote of any kind. This was incidentally an example of the success that can be obtained under a popular Government in India by a Department when it is backed by efficient technical work. A large number of Members of the Council were influential landlords, deeply interested in the development of the country-side, and they, and many others outside the Council, were anxious to take up something of practical value. It was therefore decided to start, in the main sugar-growing areas, State-aided private farms for the purpose of demonstrating the new methods of growing cane and providing the large quantity of planting material required for the extension of the area under the new varieties. The amount of aid given by the State was small, about Rs. 2,000 to Rs. 3,000 for every farm. An agreement was entered into, between the landlords and the Agricultural Department, by which the former agreed to put down a certain area under Co 213, to green-manure the land and to conduct the cultivation on Shahjahanpur lines. Cuttings were to be supplied to the locality at a certain fixed rate. In this way the example and influence of the landlords was secured at very small cost. At the same time the hold of the Agricultural Department on the country-side was increased and strengthened -- the landlords became to all intents and purposes an essential portion of the higher staff of the Agricultural Department. They differed, however, from the ordinary District staff in two important respects: (1) they possessed an influence far surpassing that of the ablest members of the Agricultural Department; (2) they were unofficial and unpaid. The contribution of the Indian landowners to this work was of the greatest importance. Without their active support and their public spirit in opening farms, and thus setting up a multitude of local centres for demonstrating on a practical scale the new method of sugar production, and at the same time providing the material for planting at a low rate, the Agricultural Department would have had to fall back on itself for getting the improvements taken up. In place of the demonstration farms, provided by the landlords at an exceedingly low cost, the Government would have had to acquire land and start local farms for advertising the new method and for the supply of plant material. The cost would have been colossal and quite beyond the resources of Government. In place of the influence and personal interest of the natural leaders of the country-side, the Agricultural Department would have had to rely on the work of a host of low-paid subordinates, and would have had to increase its inspecting staff out of all knowledge. An unwieldy and expensive organization would have been the result. All this was rendered unnecessary by the admirable system of private farms. The idea of using the landlords in agriculture began in Oudh in 1914, when a number of private farms were started on the estates of the Talukdars for demonstrating the value of the new Pusa wheats and for producing the large quantities of seed needed. Clarke extended this idea to all parts of the Provinces, and showed how the results obtained at one experimental farm could be expanded rapidly and effectively by enlisting the active help of the landowners. He provided them with an opportunity, eagerly taken up, of showing their value to the community -- that of leadership in developing the country-side by practical examples of better agriculture which their tenants and neighbours could copy. Landlords all the world over will act in a similar way once the Agricultural Departments can provide them with results of real value. The magnitude of these operations and the speed with which they were conducted will be obvious from the following summary of the final results. In 1916-17 Clarke received about 20 lb. of cuttings of Co 213 from Coimbatore for trial. In 1934-5, 33,000,000 tons of this variety were produced in the United Provinces. The value of the crop of Co 213 cane to the cultivator, at the low minimum rate fixed by Government for sugar-cane under the Sugar-Cane Act of 1934, was over £20,000,000, more than half of which was entirely new wealth. The value of the sugar which could be manufactured from this was £42,000,000. A large sum was distributed in factory wages, salaries, and dividends, to say nothing of the benefit to the British engineering trade and the effect on employment in Great Britain of orders for over £10,000,000 worth of machinery for new factories. There was no question of glutting an over-stocked market in India. All the additional sugar and sugar products were readily absorbed by the local markets. Here we have a successful effort in directed economy -- the development of imperial resources by simple technical improvements in agriculture, rendered possible by the protection of a valuable imperial market by a straight tariff. Since Clarke retired from the Indian Agricultural Department, two new factors -- both favourable -- have been in operation, which make it easy to follow up this initial success. The difficulty of producing enough humus in the villages for the trench system has been removed by the Indore system of composting. Irrigation has been improved in the sugar-growing tracts by the completion of the Sarda Canal and the provision of cheap electric power for raising water from wells. The two essentials for intensive agriculture -- humus and water -- are now available. Before long a detailed account of the progress made by the introduction of the full Shahjahanpur method will no doubt be available. The story begun in this chapter can then be carried on another stage. It will make interesting and stimulating reading. Clarke, G., Banerjee, S. C., Naib Husain, M., and Qayum, A. 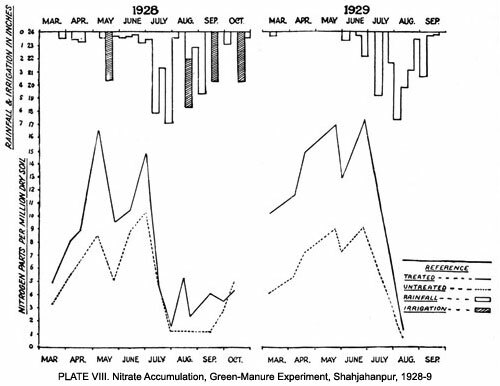 'Nitrate Fluctuations in the Gangetic Alluvium, and Some Aspects of the Nitrogen Problem in India', Agricultural Journal of India, xvii, 1922, p. 463. Clarke, G. 'Some Aspects of Soil Improvement in Relation to Crop Production', Proc. of The Seventeenth Indian Science Congress, Asiatic Society of Bengal, Calcutta, 1930, p. 23.